Athletics showed him the power of his body, but his mind deserves the credit. 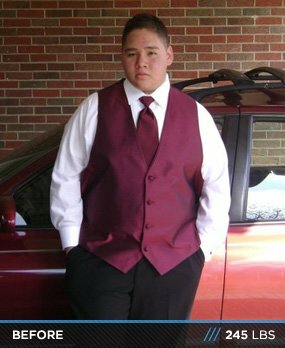 This teen made a decision to change and showed his peers that it’s possible to lose more than 70 pounds! I started as a very inactive couch potato. I was up to 245 pounds and the doctor said I really needed to lose weight, so football came around and I chose to try it out. Well, it was really hard; I got light headed and felt like throwing up, but I kept pushing. Throughout football I was a slow lineman on the JV squad. I did lose 10 pounds thanks to football. Then someone told me about wrestling, so I went in and decided to give it a shot. I was heavyweight at the beginning of the season, but I decided to eat healthier and dropped down to the 220-weight class. Throughout wrestling, I kept cutting pounds off and reached a previously unimaginable 205 pounds at the end of the wrestling season. I kept cutting until now, and I've reached my goal at 170! I'm still cutting pounds as slowly as possible to keep muscle. My bench has not gone down, and in fact, it's gone way up. 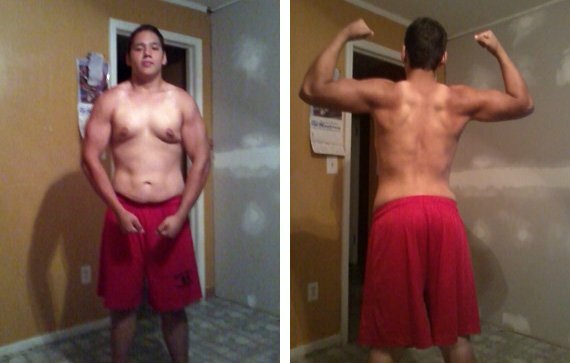 I started at 165 pounds, but now I'm up to 210 pounds on bench! You don't want to tangle with this teen on the mat. Starting off, I really didn't know much about the importance of dieting, so I researched a ton. I read labels and kept watching my carb intake. My parents were awesome and motivated me greatly. I couldn't have done it without them. I feel like the diet was the most challenging because there were days that I wanted a sweet candy. Sometimes I cheated, but who doesn't? So, instead of cheating, I bought a lot of Sugar-Free Jello to calm down my cravings and it worked. It's all about mind and willpower. My future fitness plans are complex. I want to get into bodybuilding and enter competitions. I would also like to start a program that helps overweight people start and learn to lead a healthier lifestyle. It's hard, I know, but it's all worth it! The moment you step on the scale and see it's getting lower and lower, you just get an unexplainable happiness! Just keep pushing and you can achieve it because the body does what the mind orders it to. Bodybuilding.com helped me keep track of my goals and achievements on BodySpace. I also read a ton of articles and saw other people's results. That helped me to stay motivated and keep pushing!